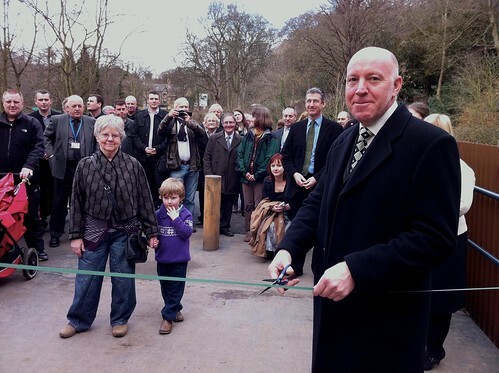 The recently completed visitor centre at Jesmond Dene, designed by local architects Mosedale Gillatt, was officially opened today. 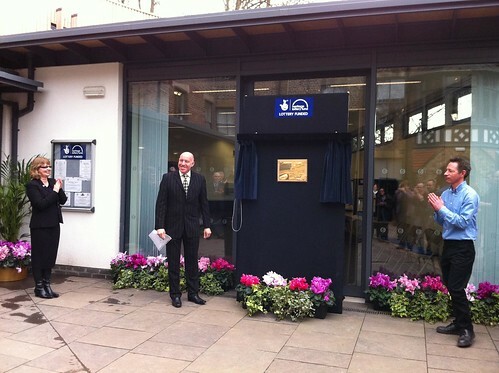 A plaque unveiling was carried out by Ivor Crowther, Head of Heritage Lottery Fund North-East. 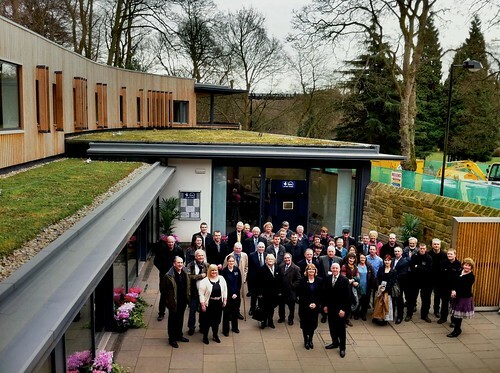 Eco-friendly features of the elegant new building include a sedum roof, a rainwater-collection tank supplying water to the toilets, a super-efficient heating system and a recycling area. Sensitive use of materials, such as Siberian larch – which weathers to a bleached grey – and the understated character of the building combine to create a pleasing harmony with the natural surroundings. 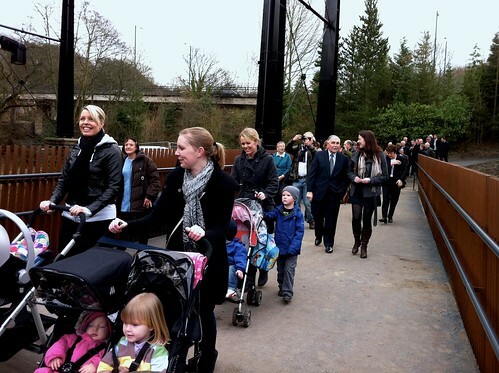 The glass-fronted building provides information and displays about the history and natural history of Jesmond Dene. 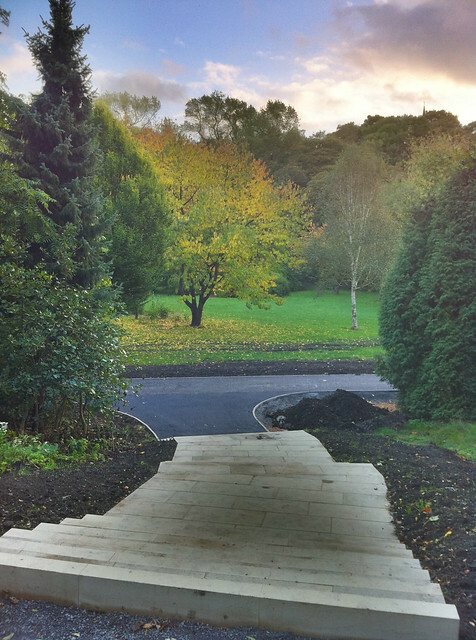 Incorporating the existing buildings of Millfield House, the site includes a classroom, a new café, outdoor terraced seating area, and improved disabled access. 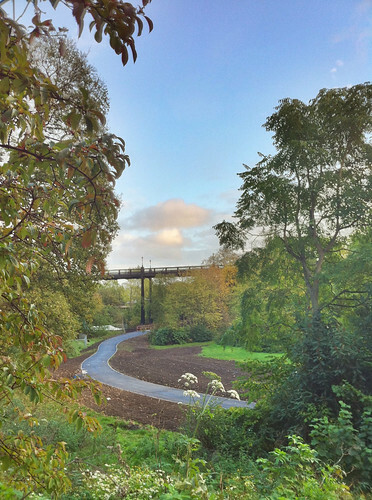 The visitor ventre, footbridge and buildings in Pets’ Corner have been shortlisted for the RICS renaissance awards in the following two categories, Tourism and Leisure and Regeneration under the title Contemporary Structures in Ouseburn Parks. The winner will be announced in mid-April. 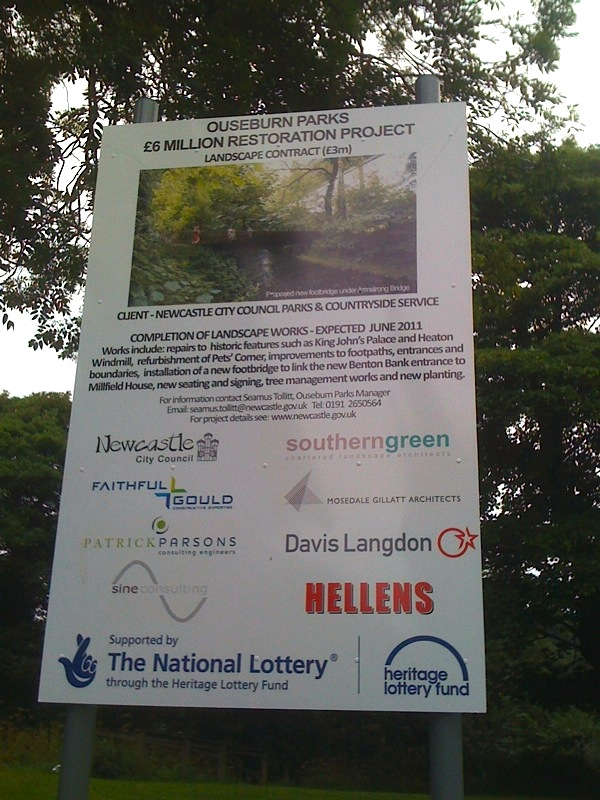 The visitor centre, and the rest of the Ouseburn Parks project, was majority-funded by a National Lottery Fund grant. 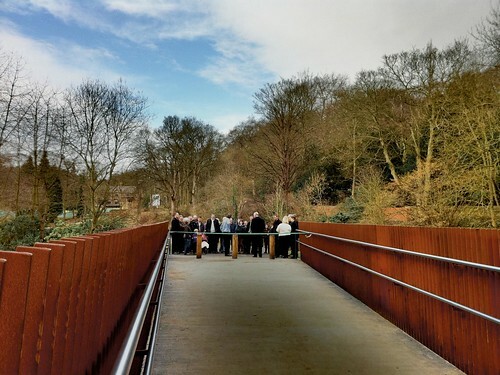 Also officially opened today was the new Ouseburn bridge, a steel pedestrian bridge across the Ouseburn, passing underneath (and at 90 degrees to) the existing Armstrong Bridge. Pets’ corner opened in time for half term week and thousands of visitors have seen the new collection of animals. 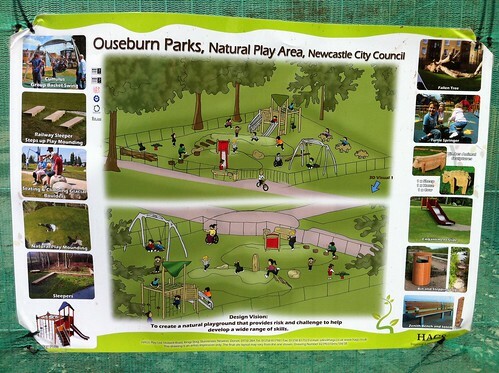 A new children’s play area near Millfield House will be completed by Easter. 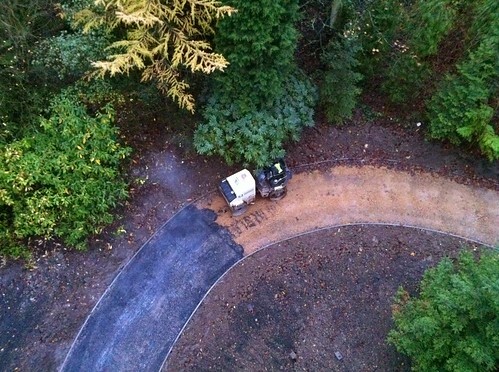 Other improvements taking place now include landscaping around the ruin of Adam’s Camera. This has now been cleared of trees and is visible from Heaton Road. 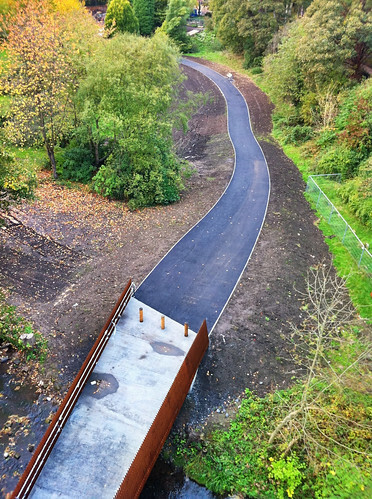 A curvy path will be installed to give access to the scenic ruin. 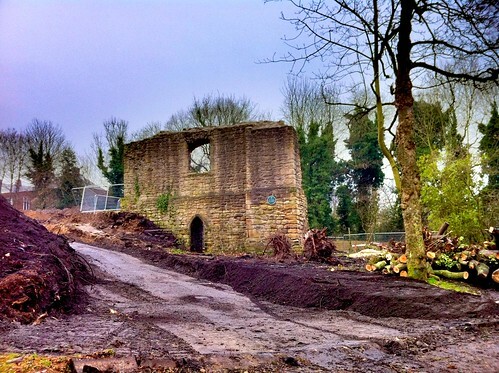 All these developments would have no doubt been welcomed by Sir William and Lady Armstrong, who in 1883 gave more than 80 acres of Jesmond Dene to the people of Newcastle in perpetuity. The Armstrongs had lived in the dene since their marriage in 1835 and built themselves a house there. As the years went by, the Armstrongs acquired more and more land in the dene and landscaped it to reflect their ideal of a wild rural setting. 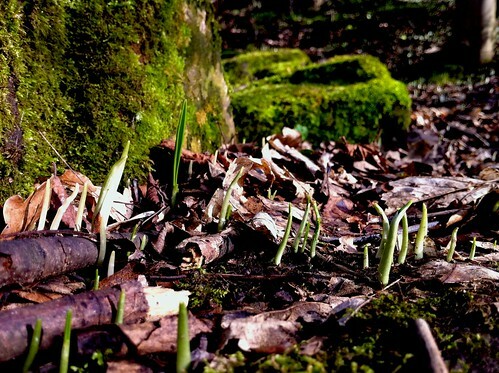 More Jesmond Dene pix here. 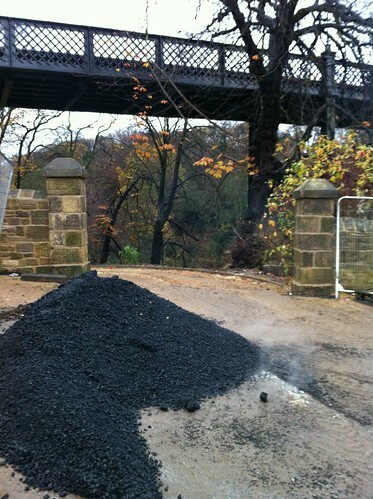 Work on the new Ouseburn Bridge has been continuing, even in this awful weather. 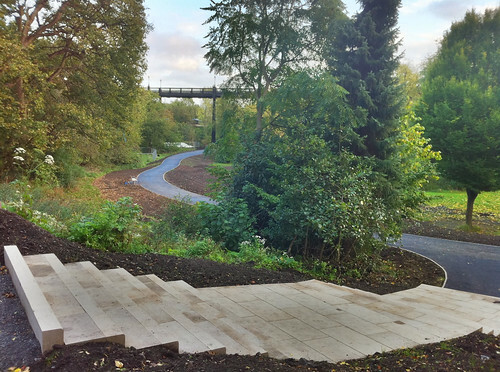 Yesterday, fresh tarmac was laid on the long, curving path down to the river, linking up with the new bridge over the Ouseburn. Now railings are being added. Here are some pix of the latest works. New steps have been installed down from Red Walk on to Coleman’s Field. 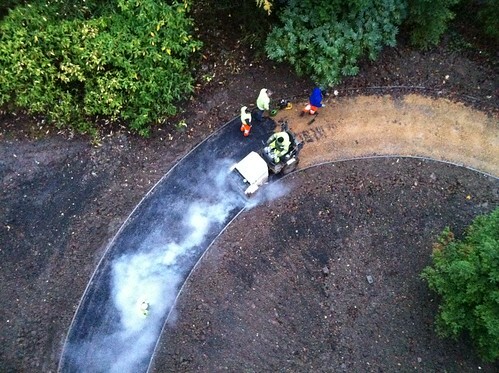 There are other developments in this part of the Dene, with construction workers dotting ‘i’s and crossing ‘t’s. 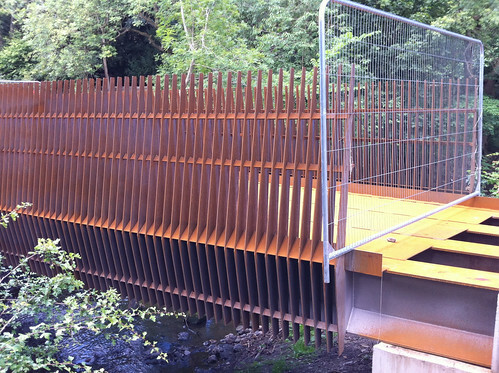 The new bridge over the Ouseburn is rusting nicely. And it’s all part of the plan. 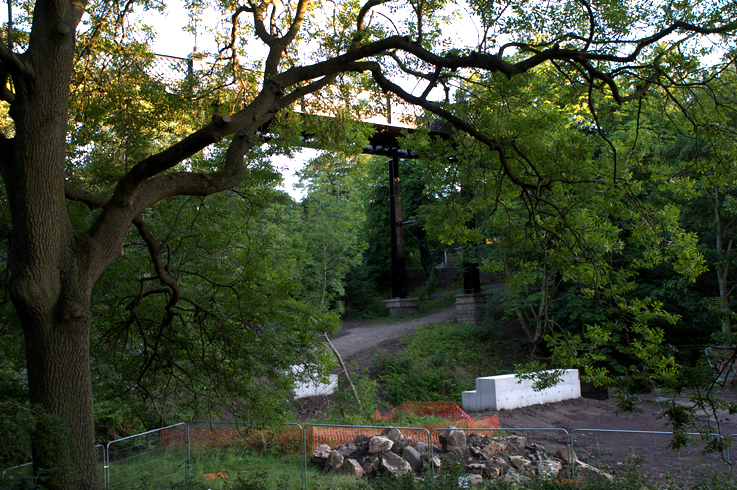 The Ouseburn has a new bridge. 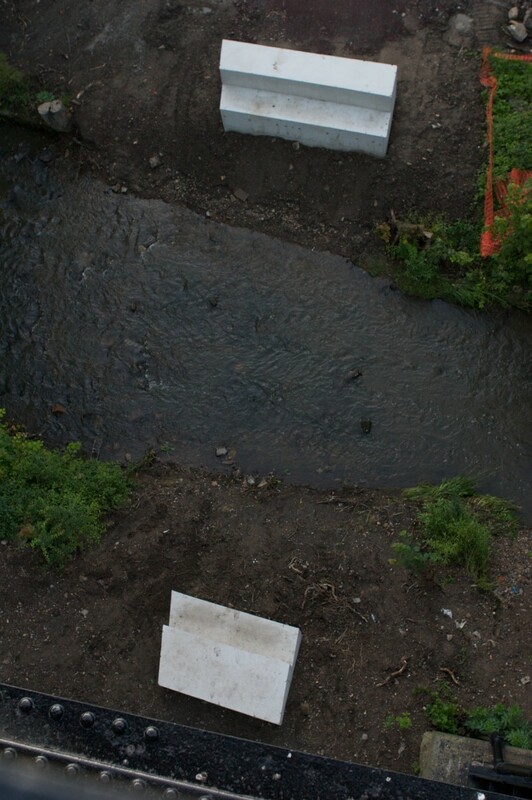 It was installed earlier today underneath Armstrong Bridge. It opens to the public later in the year. 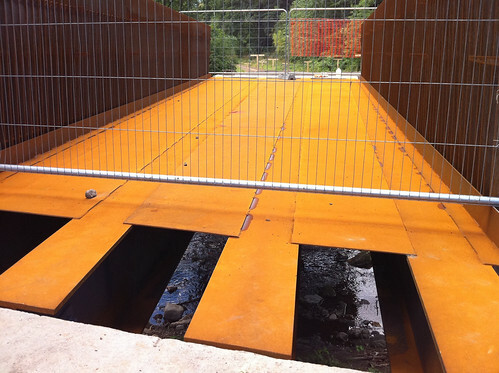 The bridge was made by Allerton Steel Ltd of Northallerton and is already starting to rust, which is all part of the design. The red patina will echo the rust on the Angel of the North. 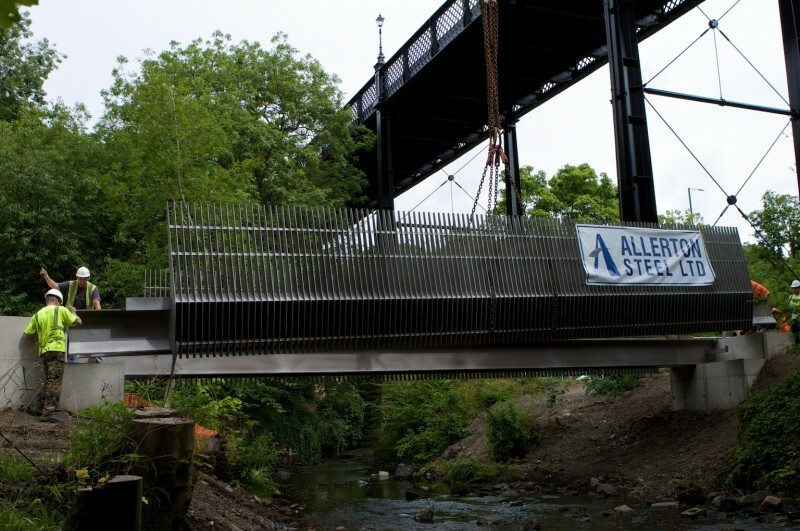 The new pedestrian bridge over the Ouseburn is taking shape, with the bankside supports now in place. 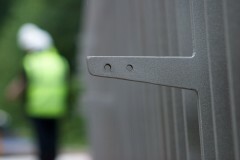 The bridge itself is being constructed in a metalworking factory on Tyneside and will be lowered into place soon. 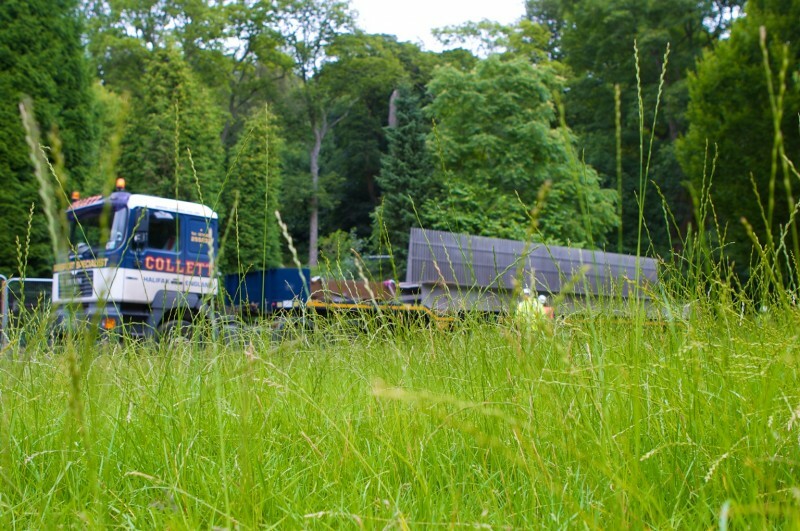 The bridge will connect Benton Bank road with Coleman’s Field, with a footpath leading to Millfield House.